Say want you want about Robert Smith, the guy knows what he likes. Since The Twilight Sad released their last LP, 2015’s critically acclaimed Nobody Wants to Be Here and Nobody Wants to Leave, The Cure front-man has given James Graham and Andy MacFarlane more than his seal of approval. He’s invited them on tour, offered mentorship and stood as a powerful champion for them. And they’ve repaid him with what, in many respects is exactly the record you would expect someone to make if they’d gone to see The Cure live every other night over a period of several months. And let’s not mince words: I love The Cure. I grew up with Robert Smith’s music and consider his work one of the most enduring and irreplaceable artistic and musical touchstones in my life. If you think The Cure are a good thing, and ever find yourself hankering after the cold tension of Faith or the sweeping cinematic grandeur of Disintegration, then there’s a lot in It Won/t Be Like This All The Time that you will want to find time for, even if it’s a record understandably prone to stand or fall on that basis. Take the opening musical lines of ‘The Arbor‘, the way that icy guitar riff comes off, just in and out of phase with the cold hiss of the robotic, half-time beat of the percussion. You could easily be listening to Faith, and that’s before the growling, low-slung bass guitar chords come driving in on it all. It’s as if Simon Gallup had actually joined the band, and it’s a testament to Graham and MacFarlane’s conviction as a songwriting duo that they pull off a song so obviously under such a particular influence. It’s a gamble, but I’d wager that it will fit the musical landscape of 2019 quite well, with our social divisions, impending ecological collapse and the general victory-of-Thanatos atmosphere currently pervading our culture. If we are going to set the clocks back thirty years we might as well plunder the era for some fantastic tracks like the ones here. ‘Chewing Gum Girl’ stands out as a particularly good example of how they can push this sound into unexpected territory. It’s ragged, heartfelt and edgy in a way that it shouldn’t be. ‘VTr’ is a pure synth driven overload of guitar textures and and features one of the best vocal performances you’ll hear this year. ‘Let’s Get Lost’ rushes in on you like an anxiety attack. There’s a story that during the writing of this album MacFarlane gave a suite of demos to Graham to write the lyrics for, and then on receipt of the results deleted all the music and started again. He credits the inspiration for this oblique strategy to Brian Eno and it’s one that has paid off. By reversing the interplay between the words and the music, Graham’s vocals are somehow exposed in comparison to their earlier records. His words on this album are raw, and his voice is pure emotion, but it’s often like listening to one half of a heated argument, every other line starting with the word you in all it’s passive-aggressive, reproachful glory and with very little context or it feels up to the listener to supply the story-telling. Violence is never far away. ‘Auge/Maschine’ supplies one of the most dramatic moments on the album. All the instrumentation drops away leaving just the voice, ‘You think that we are scared / And they won’t come for you / Will they come for you? / We will come for you,’ and those shifting, ambiguous pronouns give little clue whether this is a promise of a hug or a beating before a wall of feedback consumes any further sense. MacFarlane has written some mighty backdrops for these half-hinted tales of resentment and heartache. With bandmates Brendan Smith (formerly of The Blue Nile) and Johnny Docherty, newly promoted from touring session musicians to fully fledged collaborators, he’s whipped up a storm of claustrophobic, intense music, that never relents. It’s a loving act of homage to early eighties gothic romanticism, that in places also recalls Movement era New Order and even the Cocteau Twins of Blue Bell Knoll or Garlands. But I feel that ’It Won/t Be Like This All The Time’ is not quite the record that in its best moments we see hinted at. Individually, there’s not a bad song here, but the mood and the tempo and the emotional palette is so consistent that it doesn’t really work as well as it could as an album. The last track, the epic Videograms, plays out on a curiously hesitant note for such a single minded set of songs, the words ‘but I’m not sure‘ trailing off into nothing. There’s absolutely nothing wrong with it as a song, it’s great in fact, but it seems like a terrible way to end an LP. There’s something else here that I can’t avoid bringing up. Ultimately, for me, ’It Won/t Be Like This All The Time’ is too much like the sound of depression. Having spent a week indoors with it I’m looking forward to getting out into the rain and the cold of South Wales again. I feel like I can get this stuff in my brain any time I want and have actually done a lot of CBT and mindfulness to avoid having to listen to this kind of monologue all day. I want to be clear that I have no end of admiration for Graham’s position on these matters. The Twilight Sad were close friends with Scott Hutchison of Frightened Rabbit who died by suicide last May, and I’ve seen their live cover of Hutchison’s ‘Keep Yourself Warm’. It’s quite incredible. One of my closest and oldest friends took his own life several years ago, and I can’t emphasise enough how important to me it is to me to see a young guy like Graham so openly and completely making space for his grief. I wish I’d had the catharsis of this album at the time. But right now, it sounds too much like where I was in the months following my friend’s death. All those reproaches, those one-sided conversations that burn out when you simply run out of energy. 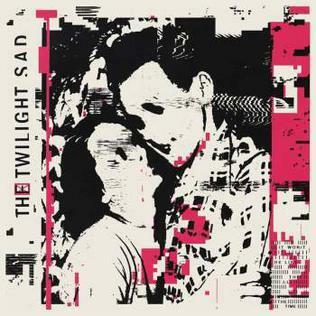 Yeah, The Twilight Sad have nailed this one: that’s exactly what it’s like and there always needs to be space for it. But you know, it really won’t be like this all the time. It Won/t Be Like This All The Time is released on 18th January through Rock Action Records.